For the fifth year running the RSPB Seabird Tracking and Research (STAR) team has returned to Colonsay for the summer months. This year the team consists of Tessa Cole, who is well known to many residents after four seasons on the island and Ruth Brown, who is new to the project but has previously worked on seabird tracking studies in both Antarctica and Hawaii. Tessa and Ruth will be working at the seabird cliffs on the west coast of the island throughout the summer, at various sites between Kiloran Bay and Port Mor. The project involves attaching tiny GPS tracking devices to individual birds in order to learn more about where they are feeding when they go to sea. The UK, and Scotland in particular, is home to globally important colonies of seabird species. In recent years many of our iconic seabirds have experienced declines, and the purpose of the RSPB STAR project is to help reverse this trend. By tracking birds while they are at sea we can identify the important areas where birds are feeding during their breeding season. This information will then help to decide the best sites to locate Marine Protected Areas, which will safeguard the feeding grounds of seabirds as well as providing a haven for other marine life. STAR follows on from the European FAME project (Future of the Atlantic Marine Environment). More information, including tracks of seabirds from Colonsay, can be found a www.fameproject.eu. In 2014, data is being collected for the STAR project at sites across Scotland. As well as Tessa and Ruth on Colonsay we also have two-man teams working on Orkney and Fair Isle, and an additional team scouring the west coast of Scotland for new sites that are suitable for tracking studies. 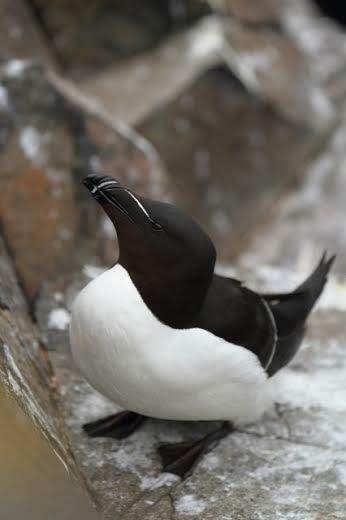 On Colonsay we are focusing on tracking four species – shags, razorbills, guillemots and kittewakes. Birds can only be tracked once they are incubating eggs, and the season has got off to a slow start this year since many of the birds have not started laying yet. This may be due to the particularly severe weather conditions of this winter, which caused very high mortality among seabirds and left surviving birds in poor condition. However, the seabird cliffs on Colonsay are now packed with birds and there are signs that laying is about to get underway, so it should not be long before Tessa and Ruth start to get some results for STAR Colonsay 2014.